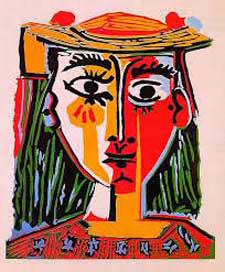 A SLEEP MASK INSPIRED BY PICASSO’S WOMEN! Our Picasso style sleep mask called ‘40 Winks’, accented with the upright cross stitch… was designed and stitched exclusively for our TWENTY- SECOND FREE VIVA ZIVA ! Newsletter #2117. 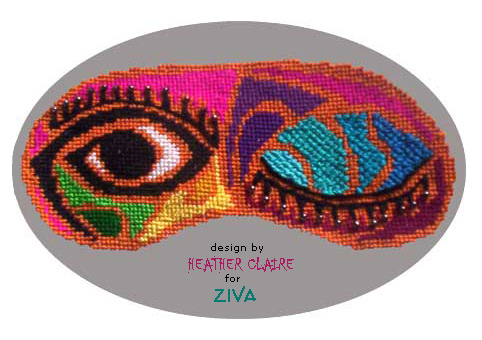 Subscribe now to ZIVA’s free newsletter ... to be released in January 2018 and stitch our free sleep mask design. 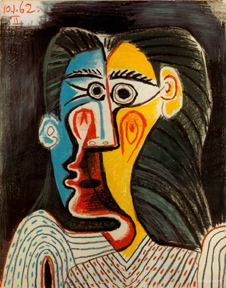 Picasso's artwork throughout his lifetime covered a number of different art movements and categories, from classicism and cubism to surrealism. The whole concept of surrealism, which came to prominence in the 1920s, is about chaos and disorder, and elements of surprise, spontaneity and illogical depictions of reality. From the 1930s onwards, there was a clear surrealist approach to Picasso’s works, with a complete disregard of the conventions and proportions of the human form. This idea of spontaneity and surprise got our creative juices flowing! We were inspired by the surreal women’s faces in Picasso’s art and created our own interpretation for this cutting-edge design called ‘40 Winks’! We selected a rainbow of vibrant colours of yellow, gold, hot pink, rose-reds, and purples, with a palette of bold blues on the closed eye…. all on a vivid orange background! The black eyelashes on both eyes have been accented by black metallic beads! We used 100 % Silk thread from the Silk Mill on the entire sleep mask in order to get the electrifying Picasso-like colours we wanted. 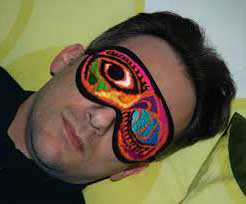 The UPRIGHT CROSS STITCH was selected for the graphic closed eye lid on the sleep mask, to create a textured surrealistic effect. The rest of the sleep mask was stitched in the Tent Stitch....with the Stem Stitch for the eyelashes! 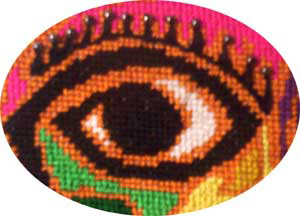 Instructions for this feature stitch are included in the next VIVA ZIVA! newsletter. GET YOUR FORTY WINKS …. AT HOME OR AWAY WITH OUR '40 WINKS’ SLEEP MASK! The twenty-second VIVA ZIVA! Newsletter updates you about our latest paintings and latest new designs! Go from this sleep mask design, featuring the upright cross stitch and have a look at other free needlepoint designs included in VIVA ZIVA newsletters!